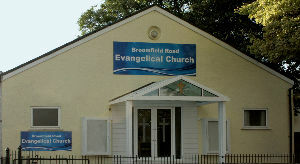 Welcome to Broomfield Road Evangelical Church (BREC). We are an independently run Evangelical Church, established in 1935. Living for others through community involvement. You can see the scope and variety of our activities and involvement both in the immediate area and overseas by navigating through the other pages of this web site.